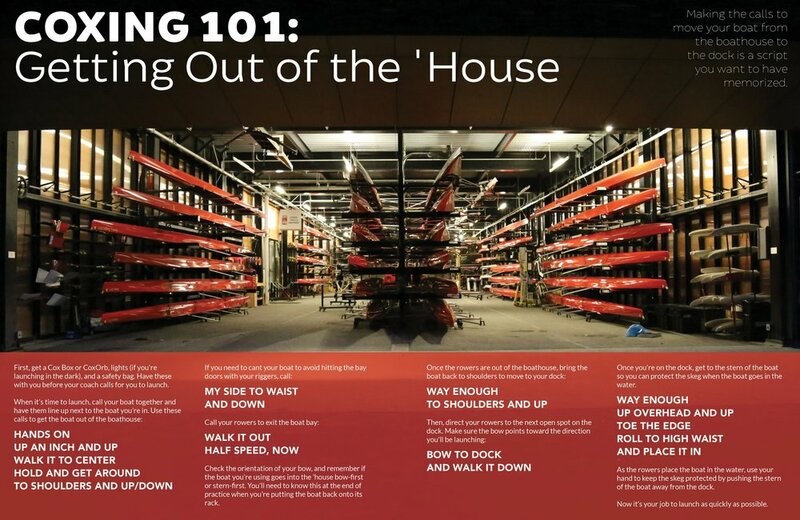 Making the calls to move your boat from the boathouse to the dock is a script you want to have memorized. First, get a Cox Box or CoxOrb, lights (if you're launching in the dark), and a safety bag. Have these with you before your coach calls for you to launch. Check the orientation of your bow, and remember if the boat you’re using goes into the 'house bow-first or stern-first. You’ll need to know this at the end of practice when you’re putting the boat back onto its rack. Once you’re on the dock, get to the stern of the boat so you can protect the skeg when the boat goes in the water. As the rowers place the boat in the water, use your hand to keep the skeg protected by pushing the stern of the boat away from the dock. Now it’s your job to launch as quickly as possible.